I need a cookie. Mainly because these are pretty much the most fantastic cookies on the planet. But also because there’s something seriously wrong with me. Right now it’s 5:48am. Why am I up at this awful hour? A few minutes ago I woke up for no reason, thought my hair that was in front of my eyes was a spider, and then proceeded to whack myself in the head repeatedly to get it off. Now I’m wide awake. Also, last night when I was making these cookies I forgot to add an entire stick of butter. AND the other night when I was at the childcare place I volunteer at, one of the other volunteers asked me if I thought one of the kids was having an allergic reaction. My first thought was, oh no. A human being is trying to communicate with me. Wait, this doesn’t happen a lot! NOOO! What should I do?! Be cool be cool be cool… So in my true awkward fashion I said something like, “Nah, he always looks sick ever since the first day he got here he hasn’t done looked right and he’s not having an allergic reaction at least I don’t think I mean, I’m no doctor but I think since the first day he got here he’s looked really sick so he’s fine so what do you think…?” I didn’t stop talking for a good 30 seconds and seriously said “hasn’t done looked right.” What does that even mean? Exactly. I can see why people love me so much. 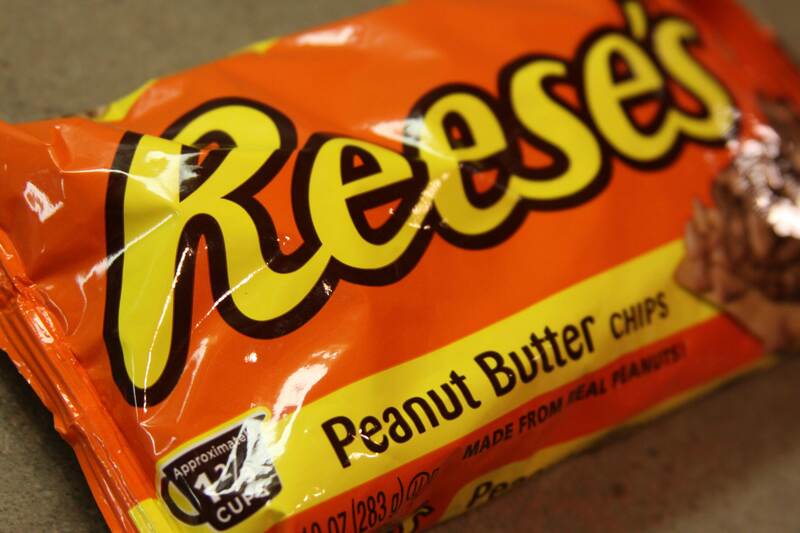 I mean, what’s greater than finding peanut butter chips in your kitchen? Well, maybe finding Joseph Gordon-Levitt in your kitchen… But, even for me, that borderlines on creepy. Emphasis on borderlines. That doesn’t mean I wouldn’t object to it. Just saying. These cookies also help ease the pain of knowing you’re going to be missing Downton Abbey next Sunday night because of the Superbowl. Let’s play a game called Things Teenage Girls Don’t Care About. I’ll go first. The Superbowl, The Superbowl, and The Superbowl. Ok, I can’t think of anything else. It’s still 5am, people. Luckily I’m going to a Superbowl party at my friend’s house and she’s pretty cool, so I won’t be too sad. I hope? I guess I could also throw in I don’t care about the Liverpool football team. Apparently they beat Manchester United the other day 2-1 and I should hate them for it. And I know this via Damian McGinty’s twitter. Even though technically someone I know likes Liverpool and I might have at least one thing to talk to them about if I liked the team too, Damian told me to like Man United. And Damian speaks the truth. Pretty much. My head still really hurts. Yeah, I’m so cool. Adapted from Allrecipes, but I made it more awesome by adding chocolate chips. Yum. In a medium bowl, cream together the butter and sugar. 1 cup of butter = 2 sticks. Don’t forget it. 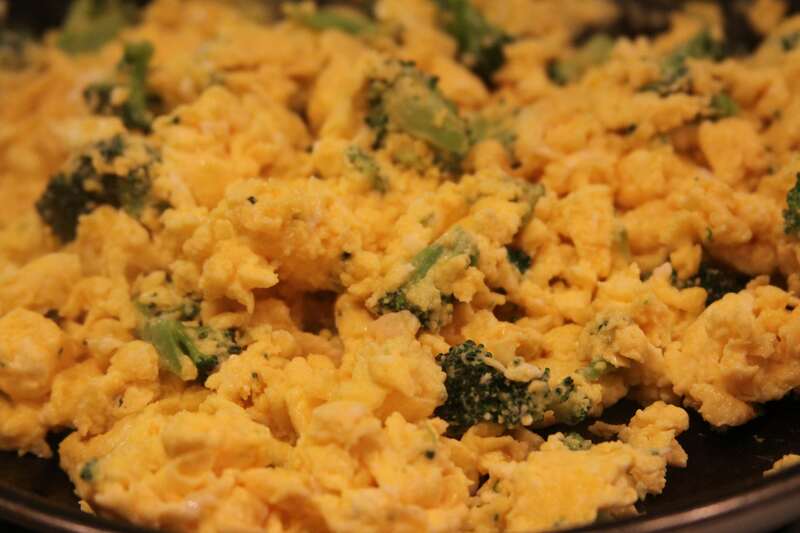 Stir in the eggs and vanilla. 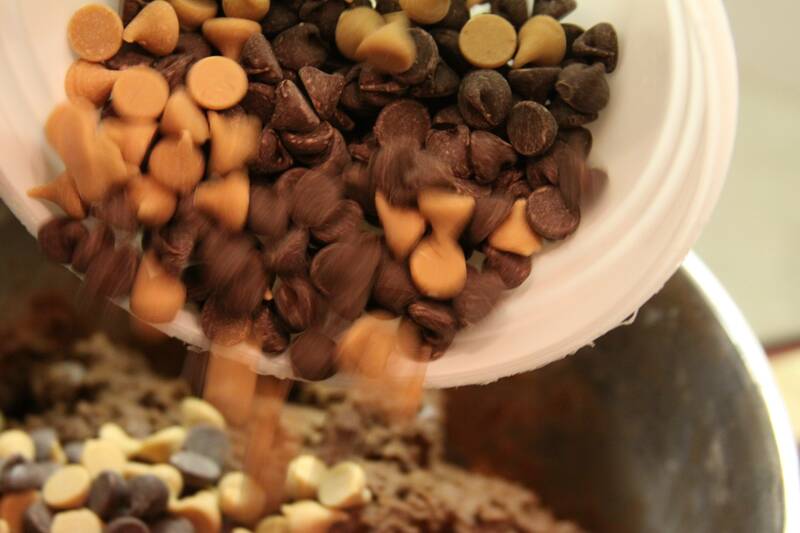 In a separate bowl, combine the flour, cocoa, baking soda and salt, and stir into the creamed mixture. 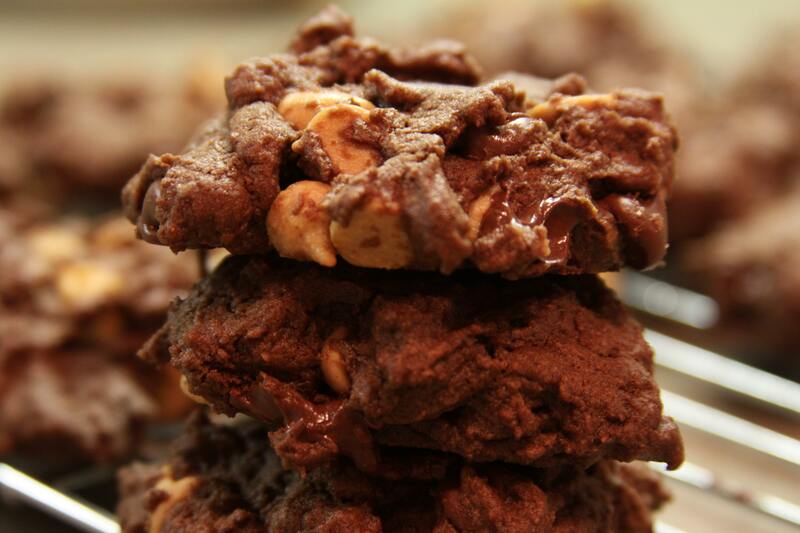 Finally, fold in the peanut butter chips and chocolate chips. Drop cookies by heaping teaspoonfuls onto the prepared cookie sheets. Flatten slightly. I’m pretty sure bacon needs to be made into a food group. Not only because it might just be the most delicious thing on the planet, but also because then at least I’d eat more food groups. I was thinking about making chicken tonight, but I wanted to make it healthy. So I went out on a limb and made some of the chicken with thyme. Thyme is a vegetable, right? Boring. So with the rest of the chicken, I turned it up to an 11. 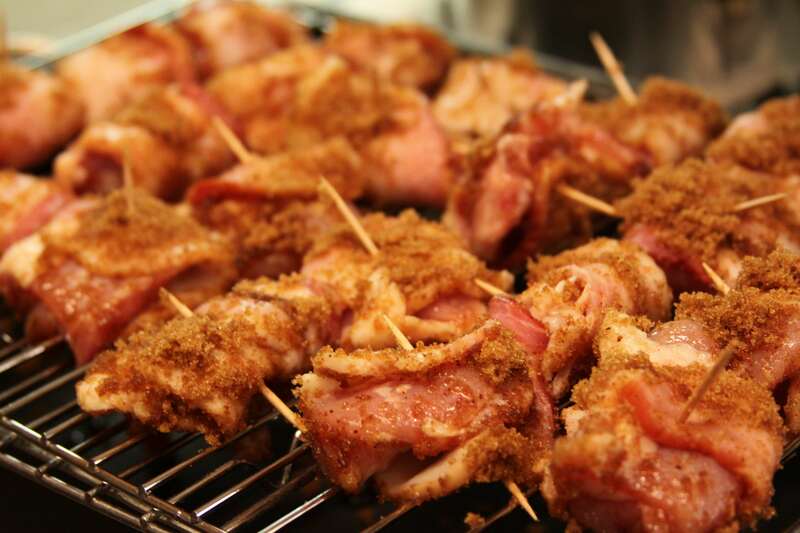 Bacon wrapped chicken, dunked into a brown sugar+chili powder mixture. Nothing more needs to be said. 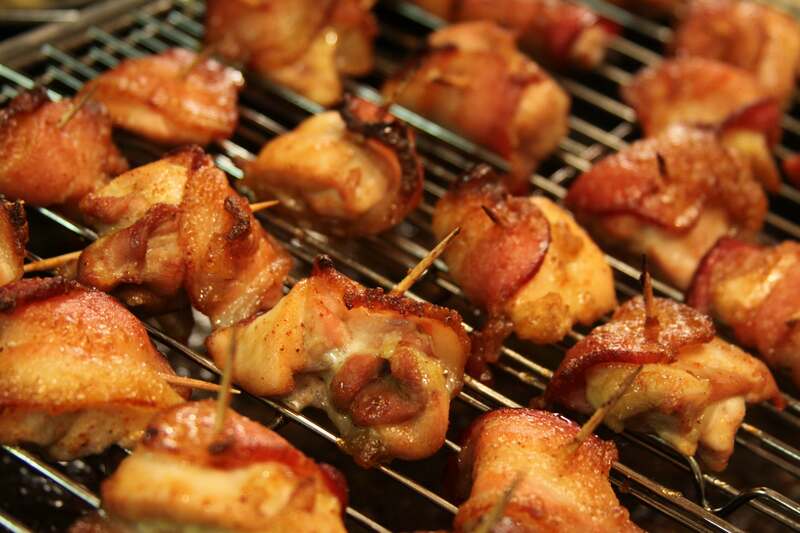 I’ve made bacon wrapped chicken before, but last time I made it it needed…something. That something was brown sugar. I would like to thank Paula Deen for the heart disease we’re all going to develop now thanks to her recipe. I honestly have no clue who this Paula chick is (you’d think that as much as I love food, I’d watch Food Network, huh?) other than she seems obnoxious and she hid her diabetes diagnosis from us. Oh, and she has the most delicious recipes ever, but I’m scared to try most of them in fear of having a heart attack at the age of 16. While I was making this, I made up a song to the tune of Billie Jean by Michael Jackson. I call it…wait for it… Paula Deen. Clever, right? The refrain goes “Paula Deen is not my dietician, she’s just a lady who feeds me yummy bacon.” And that’s all I got. I’ll work on it. Aside from becoming temporarily employed in the music industry, I also thought some very deep thoughts in the process of skewering the bacon and chicken together. What if this bacon wrapped chicken actually has a deeper meaning? What if it’s meant to represent something fantastic…such as Downton Abbey? Yes, that’s it. The chicken obviously represents the tension between the various members of the Crawly family, the brown sugar must be for the (somewhat) normalcy the staff adds to the drama the Crawlys create, and the bacon is the the Irish chauffeur, Branson. Because I love that guy. And the best part? This is all gluten free. In my world, we like to call that an epic win. 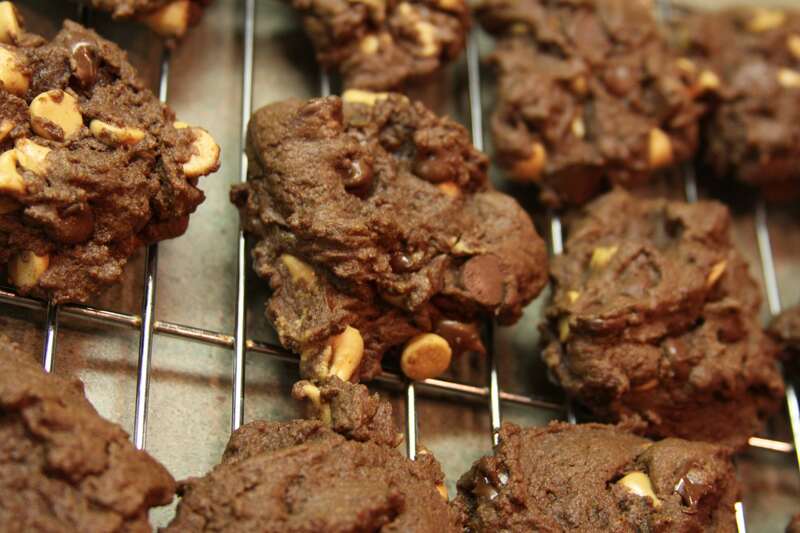 Now there’s no excuse for you not to make these…unless you’re Jewish or a vegetarian. In that case I apologize. On behalf of all the bacon lovers of the world, we’d like to express our sincere sorrow that you cannot eat this delicious food. 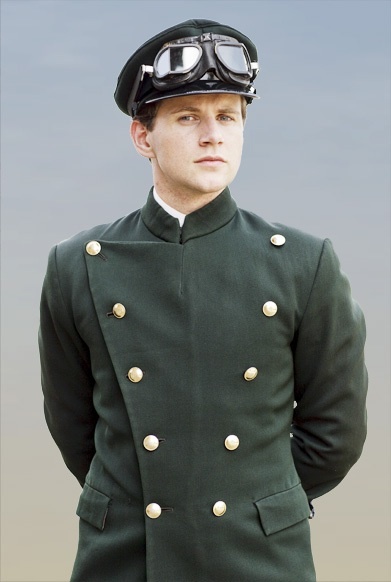 So here’s a picture of Branson from Downton Abbey for you to stare at. 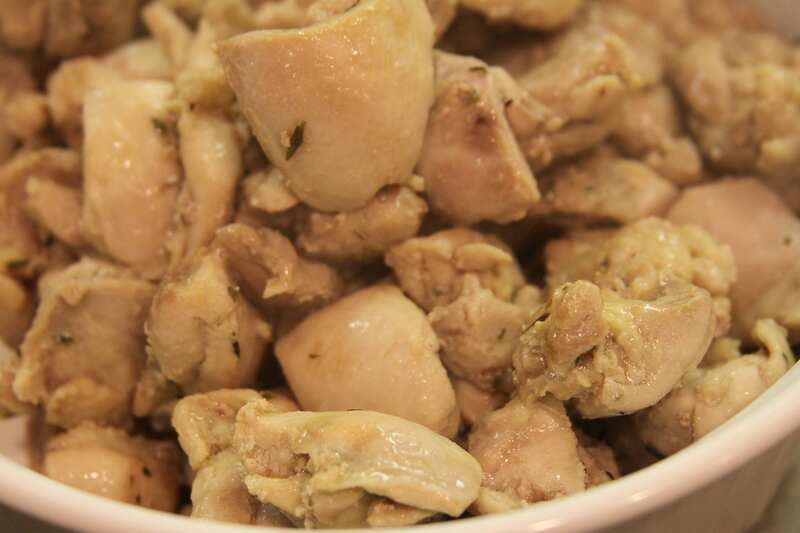 Cut chicken thighs into thirds, and then cut those thirds in half. Basically you’ll cut each thigh into 6 parts. Understand? Good, because my brain hurts and I just had to do a lot of thinking right there… Cut each bacon slice into thirds. 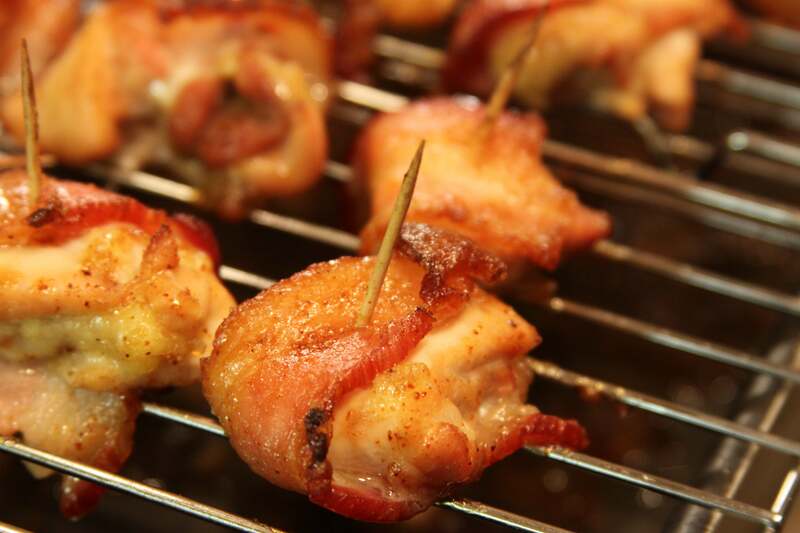 Wrap each chicken slice/cube/thing with bacon and secure with a wooden toothpick. 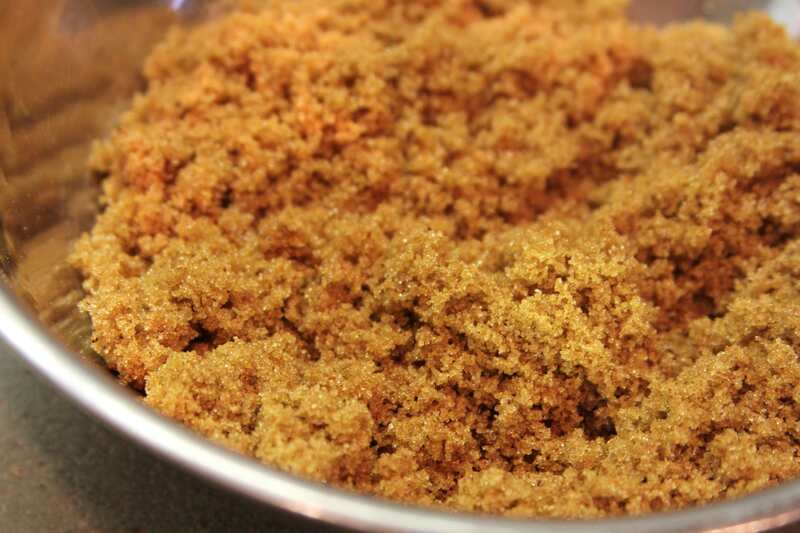 In a small bowl, stir together brown sugar and chili powder. Dredge (dredge? Wait, what? That’s the word Food Network uses. I can honestly say I’ve never heard that word in my entire life. But I’ll keep it since it sounds cool.) wrapped chicken in sugar mixture. Coat a rack and broiler pan with nonstick cooking spray. 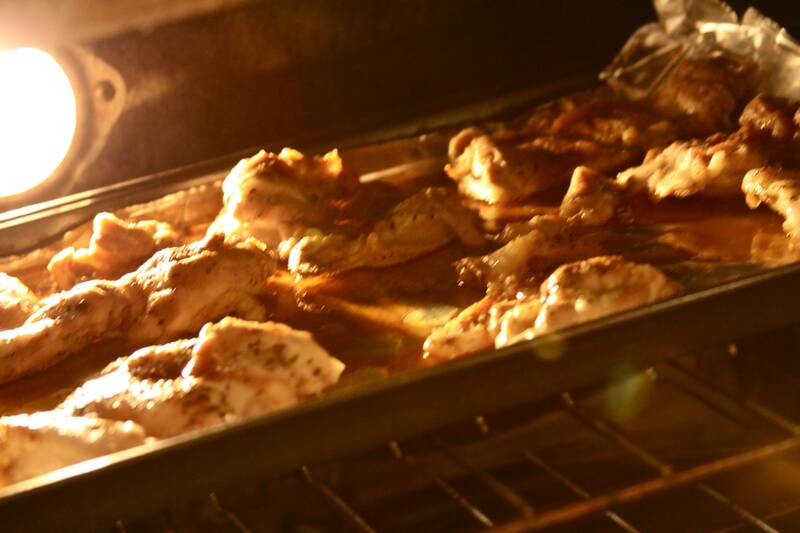 Place chicken wrap on rack in broiler pan. Bake at 350 for 30 to 35 minutes or until bacon is crisp. 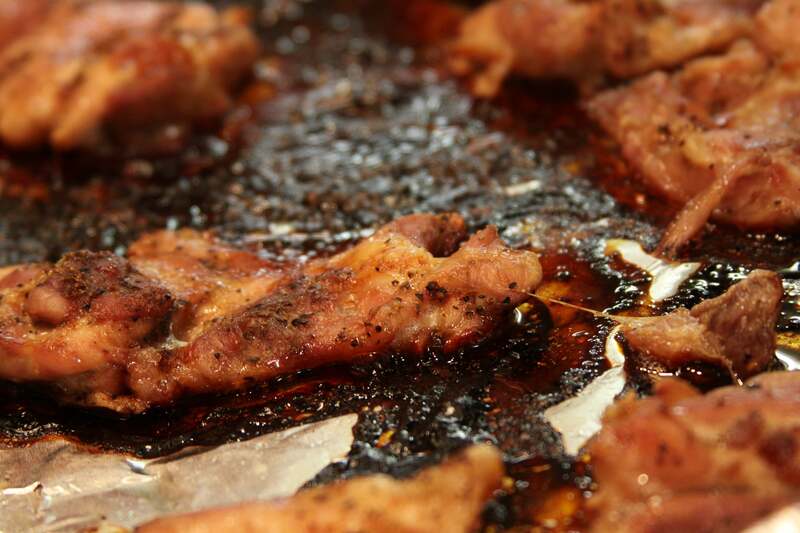 Stick under the broiler on low for 2-3 minutes at the end to crisp up bacon even more, if you so desire. Eat. I’m too hilarious for my own good. The problem with having sarcasm as advanced as mine is that sometimes quite often people think I’m a total dumbo. Seriously. The other day I was with a few people, and I was reading the back of a bottle of bleach (I’m not even going to go into the backstory…). Half of the instructions (or whatever they are) on the back were written in English, and the other half was in Spanish. So me, being the oddball I am, decided to use that moment to be funny. I proclaimed, “Hey, I can’t read Mexican!” One of the people I was with looked at me like I was totally mental, gave me the evil eye, and said, “Um, It’s Spanish.” At that point I’m pretty sure I audibly rolled my eyes and said, “I know…” Moral of the story? Always surround yourself with people who appreciate how funny you are. The end. That was a great story. 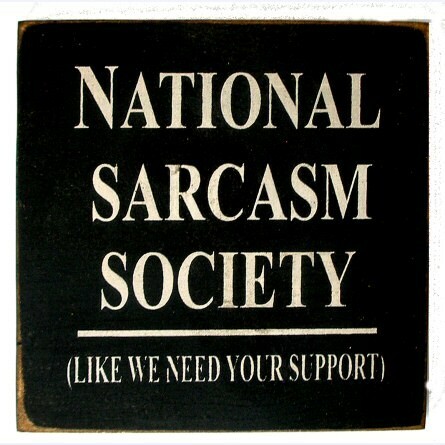 And that previous sentence was a prime example of sarcasm. Work on it, people. In other news, I’m made some food. Delicious food. Do I ever make anything else? Actually, yes, I make a lot of gross stuff…but that’s besides the point. I made crepes. Delish. Not so fast, mister. Scroll back up and admire that picture. That stupid picture took me forever to take. Not only because the lighting was all wonky (see? you can use it everywhere. ), but because the crepes cook in about 2.7 seconds so by the time I was about to get a good picture, I had to flip the crepe over or take it off the stove. You have no idea how nerve wracking it was. Food, done right, really is a work of art. You know what else is a work of art? Matt Bomer’s eyes. I love blue eyes. Seriously, if you have blue eyes, you’re automatically that much cooler in my book. And actually, looking back, every single best friend I had as a child had blue eyes. Coincidence? I think not. Can I say the words “blue eyes” anymore in one paragraph? Again, I think not. Wonky. I have to trick myself into eating vegetables. I hate them. And I’m not trying to be a cute and dumb (when is dumb ever cute? 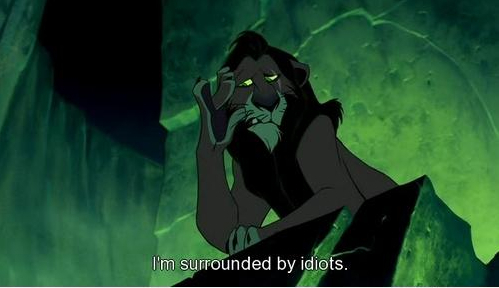 Seriously.) girl and be like, “Heehee, I hate veggies! They’re grrrrooossssssss. And now I shall throw myself at every guy within a 100 foot radius of myself.” No. I take pride in the fact that I’m pretty intelligent, I’m not desperate for attention, and I seriously hate vegetables. But smother them with cheese and I’ll eat them. So I put extra cheese in the scrambled eggs and guess who ate all her veggies tonight? Me! Who’s impressed? 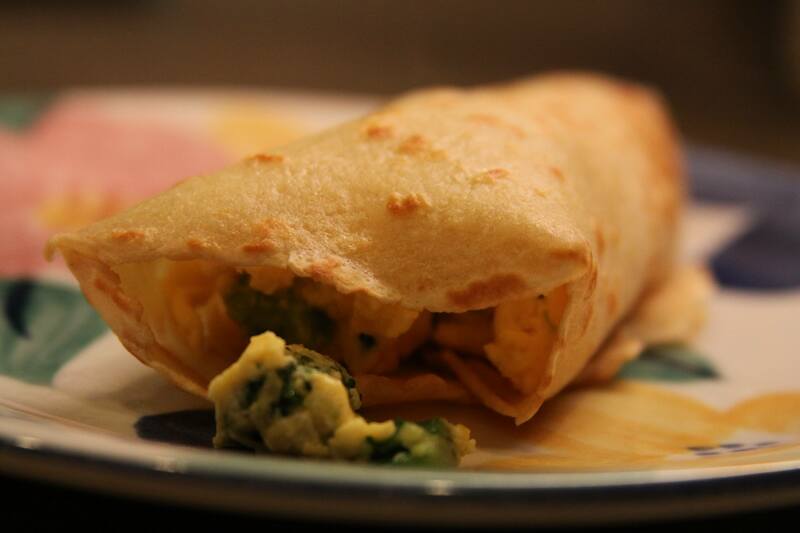 If you haven’t made crepes before, do it. I triple dog dare you. They’re actually much easier than you’d think. 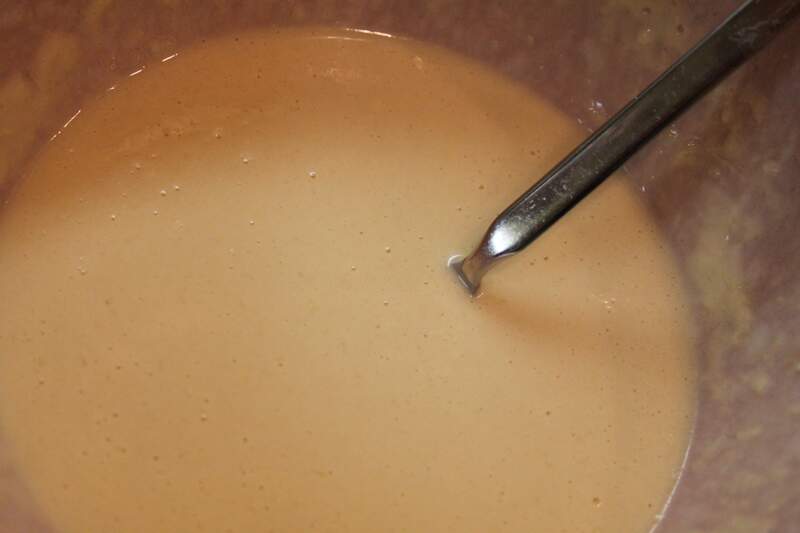 It’s the whole quickly-swirling-the-batter-in-the-pan-to-evenly-coat-and-if-it-isn’t-even-it’ll-cook-all-wonkishly part that gives me a small heart attack. But once you’re on your 3rd crepe or so, things get easier. Scouts honor. Wonky wonky wonky. Ok, now it doesn’t even sound like a word anymore. I need a new adjective. In a large mixing bowl, whisk together the flour and salt. In a separate bowl, combine the milk and water. Slowly add the flour/salt mixture to the milk/water mixture. Add in the butter, and beat until smooth. 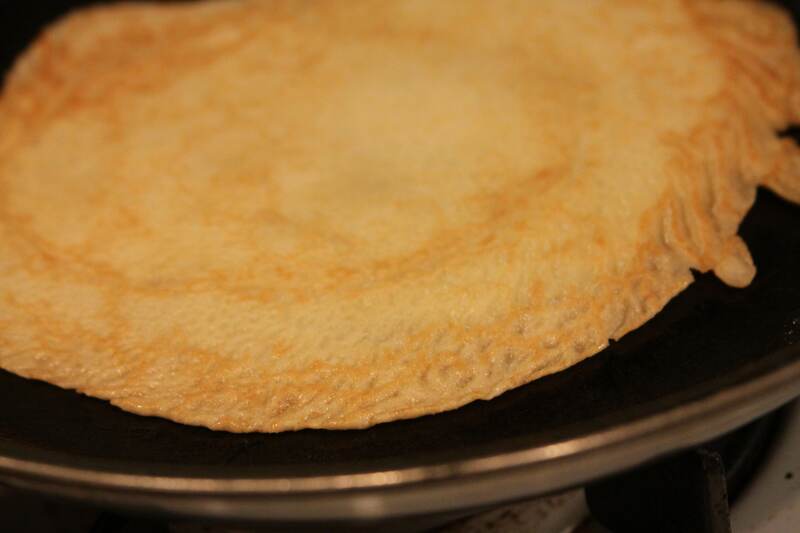 Cook the crepe for about 2 minutes, until the bottom is light brown and no longer wonky. Loosen with a spatula, turn and cook the other side. Serve hot. I promise this post has nothing to do with England. At all. Nope. Anyway, back to being spontaneous. I enjoy being spontaneous. Like today, I was quite spontaneous when I chose pink rubber bands for my braces. And as someone who hasn’t worn pink in many, many years, this was definitely a spontaneous choice…thing. That, and I always get so flustered when I have to pick out rubber bands. You understand. I also enjoy being spur of the moment when it comes to food. Earlier this afternoon, I had 8 chicken thighs defrosting in the microwave and not the foggiest idea in my head of what to make for dinner. Then, BOOM, this random recipe showed up. I have no clue how I found it (that seems to be the case for a lot of the food I make, huh?) but it sounded good. Basically you put garlic pepper on both sides of chicken, dump some brown sugar on it, and bake it for an hour? Easy. And yumtastic. Oh, you want me to stop talking and you’d like to see some pictures? Well here you go. First off, let me say just how hard it is to take pictures of food while it’s in the oven. If you forget to take pictures of the prep (not that I did or anything…yeah…), you are forced to open the oven, let the 350 degree air singe your face off, just so you can try (and fail) to take a picture. Oh yeah, and all while your dog is sniffing your hair. Awkward. And that black icky looking stuff? Burnt brown sugar. Delicious. If you make this and get bored in between taking the chicken from the oven and eating it, feel free to eat the burnt brown sugar. Straight out of the oven, it’s pretty amazing. Oh yeah, and in case you couldn’t tell, the title is a total lie. Kind of like how I said that this blog would be about me cooking my way through the Silver Spoon. Lies all around. Adapted from some random website. So let’s just say it was pretty much made up by me, ok?